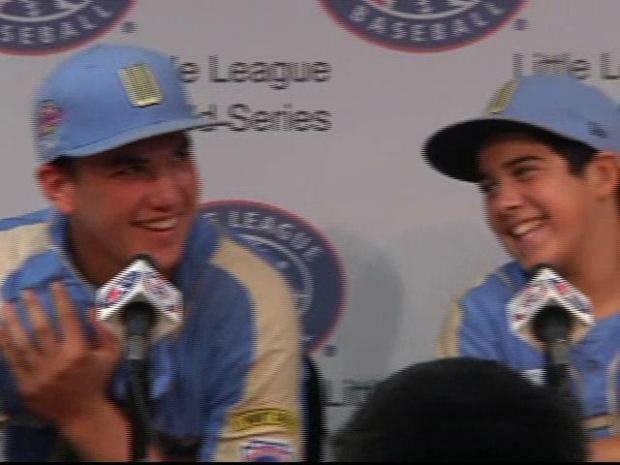 Park View from Chula Vista came up big late to win the Little League World Series. 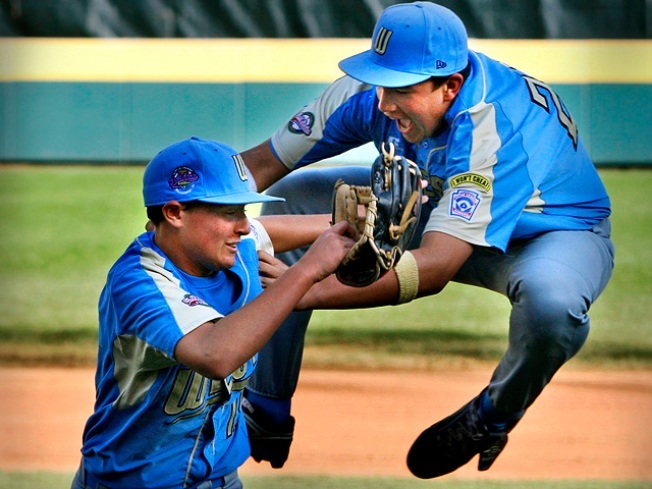 Chula Vista, Calif. first baseman Luke Ramirez, right, celebrates with pitcher Kiko Garcia after getting the last out of the game in a 6-3 win over Taoyuan, Taiwan in the Little League World Series Championship baseball game. In front of more than 30,000 people in Williamsport, Pa., and many more watching around the world, the Park View Little League team became the first team from San Diego County to win the Little League World Series in more than 40 years. And they did it without their trademark homeruns. The Park View boys from Chula Vista won the coveted title, 6-3, over Chinese Taipei in a game filled with drama. Things did not start well for Park View. Chinese Taipei hit back-to-back home runs in the third inning to take a 3-0 lead. But a three-run lead is not much against Chula Vista. In the bottom of the fourth inning, Chula Vista was able to close the gap to 3-2 with their slugger, Kiko Garcia, at the plate. Instead of a home run, Taiwan's catcher let's one get away, allowing just enough time for the player on third to come home on the passed ball. After an intentional walk to Luke Ramirez, Bulla Graff singled to right field to give Chula Vista its first lead, at 4-3. In the fifth inning the crowd was chanting “P-V-L-L” and the team listened. They weren’t giving anything up. The Park View boys from Chula Vista are one win away from being crowned Little League World Series Champions, but they've already made history. Chinese Taipei threatened in the very next inning. With runners on first and second, Garcia walked the next batter to load the bases with one out. The next batter for Chinese Taipei grounded to short stop Andy Rios, who tagged the runner headed to third, and then threw to first for a double play to end the inning and the threat. Park View got some breathing room in the bottom of the fifth. With two out and two on base in the inning, Seth Godfrey connected with a drive down the left field line to plate Park View's fifth run. The next batter, Rios, also delivered an RBI hit to make it, 6-3. Later in the inning: Chinese Taipei's worst nightmare. The bases were loaded for 6-foot-2 Luke Ramirez as he stepped to the plate. The first baseman connected, sending one deep -- really deep -- to center field. Thoughts of a Grand Slam ran through fans' heads -- but it wasn't meant to be. The center fielder caught the fly ball only inches away from being a home run. Park View still led, 6-3, going into the final inning. In the final inning, Garcia retired the first two batters and then hit the third. That put a runner on base with two out. But Garcia was too much for the Chinese Taipei batter, who struck out to end the game. For Park View fans that couldn't travel to Williamsport to see the game in person, there was one place to be. Fans arrived at Oggi's pizza hours before the game's first pitch just to get a seat. "It's awesome, it's incredible, so surreal, it's like a dream," Brett Joiner said. Some stood and others chose to dine in the waiting area. Everyone had their eyes glued to the national broadcast carrying a team's dream of winning it all back to the home town. “It's crazy, it's beautiful. At times like this everyone is united. You can hear the noise," Nick Milligan said amid an excited crowd. Were they keeping their emotions in check? Not at Oggi's. “Three up, three down,” one fan shouted in elation. The bar erupted as Park View squashed a late rally with an inning ending double play and then came the hugs and even tears. “Oh my gosh, this is unreal, this is awesome, they deserve it,” Carol Ruiz said. “All the way, world champs. Woo hoo Park View!" “Super Job Guys...They put San Diego on the map in a good way,” wrote Gina Newton. “Go San Diego!!!!! We are the champions!!! !” posted Patti Cariad. “I knew they would win those kids have their act together,” wrote Sheila Newbery. Add your comment below or on our Facebook page and we’ll be sure to pass it along to the team and coaches. The team is scheduled to return to Ontario this evening. The Park View Little League is working on a meeting place for fans to welcome the team home. A homecoming celebration is scheduled for Friday at 6 p.m. at Memorial Park, 373 Park Way in Chula Vista.